Predominantly Protestantism. Some adherents of Catholicism, Islam, and other faiths. Jamaican Americans are Americans who have full or partial Jamaican ancestry. The largest proportions of Jamaican Americans live in South Florida and New York City, both of which have been home to large Jamaican communities since the 1950s and 60s. There are also communities of Jamaican Americans residing in Philadelphia, Boston, Tampa, Los Angeles, Orlando, Baltimore, Washington, D.C., Atlanta, Cleveland, Western New York, Connecticut, and New Jersey. After 1838, European colonies in the Caribbean with expanding sugar industries imported large numbers of immigrants to meet their acute labor shortage. Large numbers of Jamaicans were recruited to work in Panama and Costa Rica in the 1850s. After slavery was abolished in the United States in 1865, American planters imported temporary workers, called "swallow migrants", to harvest crops on an annual basis. These workers, many of them Jamaicans, returned to their countries after harvest. Between 1881 and the beginning of World War I, the United States recruited over 250,000 workers from the Caribbean, 90,000 of whom were Jamaicans, to work on the Panama Canal. During both world wars, the United States again recruited Jamaican men for service on various American bases in the region. The vast majority of Jamaican Americans are of black Afro-Caribbean descent but there are also some of Chinese Jamacian descent. Apart from Canada and England, the U.S. houses the majority of Jamaican émigrés worldwide. Jamaican immigration to the U.S. increased during the civil rights era of the 1960s. As with many other sources of Caribbean immigration, the geographical nearness of Jamaica to the U.S. increased the likelihood of migration. The economic attractiveness and general Jamaican perception of the U.S. as a land of opportunity explain continued migration flows despite economic downturn in America. Traditionally, America has experienced increased migration through means of family preference, in which U.S. citizens sponsor their immediate family. Through this category a substantial amount of Jamaican immigrants were able to enter mainly urban cities within the U.S that provided blue-collar work opportunities. Jamaican immigrants utilized employment opportunities despite the discriminatory policies that affected some Caribbean émigrés. At present, Jamaicans are the largest group of American immigrants from the English-speaking Caribbean. However, it is difficult to verify the exact number of Jamaican Americans in this country because most of them assimilate into the wider black community. The 1990 census placed the total number of documented Jamaican Americans at 435,025. According to the text of Immigrant America (p. 69)[clarification needed], there were 554,897 Jamaican-born people living in the U.S. in 2000. This represents 61% of the approximate 911,000 Americans of Jamaican ancestry. Many Jamaicans are second, third and descend from even older generations, as there have been Jamaicans in the U.S. as early as the early twentieth Century. The regional composition is as follows: 59 percent live in the Northeast, mainly in the State of New York; 4.8 percent in the Midwest; 30.6 percent in the Southern United States, particularly South Florida; and 5.6 percent on the West. The New York metropolitan area and South Florida have the largest number of Jamaican immigrants in the United States and are home to the highest number of illegal Jamaicans, whereas most Legal immigrants tend to reside in Brooklyn. Jamaicans refer to Miami metropolitan area and Brooklyn colloquially as "Kingston 21" and "Little Jamaica" respectively. Jamaicans in the Miami metropolitan area mostly live in Broward County and Jamaicans in New York City have formed communities in Brooklyn, The Bronx, and Queens, with Central Brooklyn, particularly Canarsie, Crown Heights, and East Flatbush, and the Northeast Bronx, particularly Williamsbridge, Bronx neighborhoods holding the largest Jamaican populace. Large communities of Jamaican immigrants have formed in New York City and the New York Metro Area, which includes Long Island and much of New Jersey and Connecticut, along with Florida (centered in and around the Miami, Tampa, and Orlando areas), which has the second largest Jamaican community in the U.S, and Philadelphia. In recent years, many Jamaicans have left New York City for its suburbs, and large Jamaican communities have also formed in Atlanta, Baltimore, Chicago, Washington D.C., Boston, Cleveland, Buffalo, Rochester, Los Angeles, and Providence. The median age for Jamaican immigrants is 49 years old, which is significantly higher than the general immigrant median age. And according to the MPI tabulation of data from the U.S. Census Bureau 2014 ACS – 6% of Caribbean immigrants are under the age of 18, 75% are between the ages of 18 – 64, and 19% are 65 and older. 24% of Jamaican immigrants have a bachelor’s degree (which is a bit lower than the general immigrant population, which is 29%). 76% of Jamaican immigrants are working age (18 to 64). According to the MPI tabulation of data from the U.S. Census Bureau 2014 ACS – 30% of Caribbean immigrants are in the service occupations, 21% are in sales and office positions, and 25% are in management, business, science, and arts occupations and only 9% of Jamaican immigrants are in construction, and maintenance jobs. Jamaicans specifically, 32-37% seek management, business, science, and arts positions. The median Jamaican immigrant yearly income is $51,000 with a 13% poverty rate. The median Jamaican immigrant income is higher than the average Caribbean immigrant income, which is about $41,000 with a 20% poverty rate (and Dominican immigrants income is as low as $32,000 with a 24% poverty rate) (U.S. Census Bureau 2014). According to World Bank data, in 2014, the Caribbean as a whole was sent $9.7 billion, 8% of the US GDP as remittances, not including Cuba, which is estimated to send $1.8 billion. According to the 2010 U.S. Census, there were 965,355 Jamaican Americans. Pete Rock performing at Razel and Friends - Brooklyn Bowl, 2016. Many cultural events in Jamaica are also observed by Jamaican Americans in local public celebrations or in the privacy of their homes. Many Jamaican Americans have also been very influential and successful in rap music. Famous rappers and DJ's such as DJ Kool Herc, Busta Rhymes, The Notorious B.I.G., Pete Rock, Canibus, Heavy D, Slick Rick, and Bushwick Bill are all of Jamaican heritage. Jamaica's most popular musical forms are reggae and dancehall. There are also others such as "dub poetry" or chanted verses, Ska, and Rocksteady, with its emotionally charged, celebrative beat. Jamaican Americans also listen to a great variety of other music such as: jazz, calypso, soca, ska, rap, classical music, gospel, and "high-church" choirs. A plate of Jerk chicken. 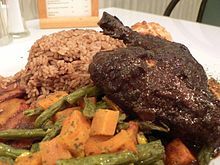 In Miami and Brooklyn, especially in the neighborhood of Flatbush along Flatbush, Nostrand, Utica, and Church Avenues, one sees groceries filled with a variety of Caribbean cuisines, including sugar cane, jelly coconut, and yams. In New York City, Jamaican Americans participate in the Caribbean Labor day parade in Brooklyn annually and dress in lavish and colorful costumes during the Brooklyn celebration along Eastern Parkway. A number of Jamaican Americans have excelled in international competition and carried home many trophies. Donald Quarrie won the 200 and the 4 × 100 meters relay Olympic Gold Medal. Merlene Ottey won the 200 and the 4 × 100 meters relay. George Headley, who was born in Panama in 1909, transported to Cuba, grew up in Jamaica. and lived in the United States. Several Jamaican Americans, including Jeff Cunningham, Robin Fraser and Mark Chung, have played for the United States national soccer team. For a more comprehensive list, see List of Jamaican Americans. ^ Jones, Terry-Ann. Jamaican Immigrants in the United States and Canada: Race, Transnationalism, and Social Capital. New York, NY: LFB Scholarly Piblishing LLC, 2008. 2–3; 160–3. Print. ^ Bureau, U.S. Census. "American FactFinder - Results". factfinder2.census.gov. Retrieved 2018-06-01. ^ "Ancestry Map of Jamaican Communities". Epodunk.com. Retrieved 2008-08-03. ^ "Top 101 cities with the most residents born in Jamaica (population 500+)". city-data.com. Retrieved 2008-08-03. This page was last edited on 7 April 2019, at 06:58 (UTC).